Paradigm looks bonkers and it is. Released on PC early last week, it pokes fun at the systems we’re all constrained by, inspired by classic point-and-click games. A surreal adventure game set in a post-apocalyptic Eastern European country, Paradigm explores the theoretical use of genetics technology by the rich and powerful to help them spawn prodigy children, something that feels somehow timely in the same week that the Trump administration was compared to a family business. The game’s titular character is one of these offspring, but a botched version, which leads the company who created him to try and dump him in an abandoned “Neo-Soviet” town. It’s a weird game full of vomiting sloths, the dream of completing a musical EP, and lots of other ambitions that mix the mundane with the twisted. “My influences came from your typical adventure game fan fare, primarily the Lucas Arts games,” said Jacob Janerka, the game’s creator. (You might remember him for making these spot on Seinfeld adventure game recreations last year). “However I wanted to create a unique world that no other game would share.” This led him to try and re-create a recent trip to Eastern Europe and his experiences there as a backdrop for the game’s adventure mechanics. “Even though the world is set in Eastern Europe, its a pretty surreal world, so I took influences from just about everything that I loved. Mighty Boosh, Dune, Fallout, Pixar, 2001 Space Odyssey, Gattaca, Flight of the Conchords, Monty Python.” he said. “As you play the game, if you broke it down, you could probably tell what I was watching and listening to at the time.” While it sounds like an eclectic and even contradictory mix, five minutes with the game will make them all feel like natural touchstones. The game plays with the human and grotesque in a way that can be unsettling but also heartwarming. “One thing that happened during the development is that I showed it at a local show,” said Janerka. 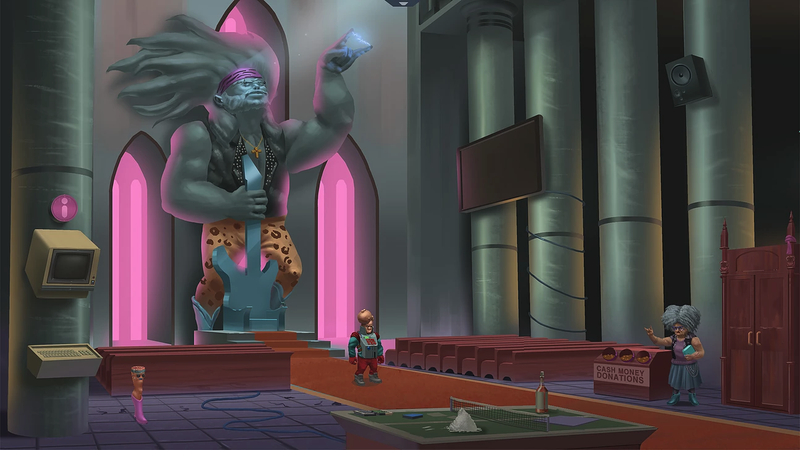 A sort of museum for different science fiction references and adventure game inspirations, Paradigm imbues its story and themes with weight not by leaning too much into the political trappings of its world building, but rather by focusing on the small goals and idiosyncrasies of its characters. After all, Paradigm’s ultimate goal isn’t to flee his oppressive world or overthrow it. He just wants to finish the electronic album he’s been working on, just like the game’s creator. “As for developing the modern adventure game. It is definitely difficult to get that balance right,” said Janerka. “The modern player is a lot less forgiving. One of the keys is to make sure the player has a defined goal to complete.” Without that, things can get frustrating as the player gets lost in a sea of wandering backgrounds and obtuse storytelling. Fortunately, Paradigm is content simply to let the player toy around with its messed up world and strive to help Paradigm create find some meaning in the process.